In honor of former Steelers’ President and U.S. 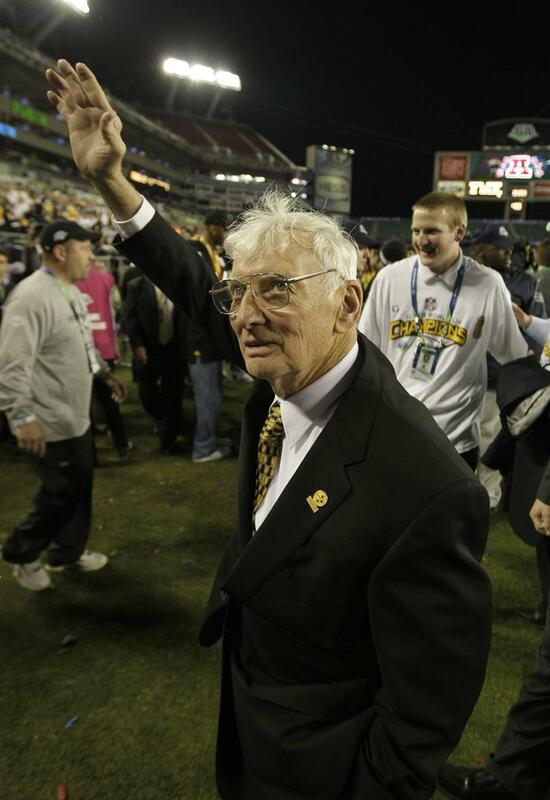 Ambassador to Ireland Dan Rooney, Pittsburgh residents took over Heinz Field Monday and will commemorate his death in Oakland Tuesday. Rooney died last Thursday, April 13, at the age of 84. On the day following his death, Gov. Tom Wolf ordered the Pennsylvania commonwealth flag to fly at half-mast throughout the state. “Mr. Rooney was truly loyal and dedicated to the tremendous organization he built and the city and country that he loved,” Wolf said in a press release. Throughout the day Monday, admirers and fans visited Heinz Field to pay their respects at a public viewing from 2 to 7 p.m. His private funeral mass is set for 11 a.m. Tuesday at the Saint Paul Cathedral in Oakland. One or more lanes along Fifth Avenue between North Neville Street and University Place will be shut down from 9 a.m. to 3 p.m. for Rooney’s processional, according to the Pittsburgh Department of Public Safety. Only residents will be able to access the block of North Dithridge Street that is bordered by Bayard Street and Fifth Avenue from 10 a.m. until 3 p.m., and South Dithridge Street will also be restricted to residents from 10 a.m. until 3 p.m.
President Barack Obama, who appointed Rooney to the ambassador position he held from 2009 to 2012, will also attend the funeral, according to a statement Trib Live received from Obama spokesperson Kevin Lewis. “Dan Rooney was a great friend of mine, but, more importantly, he was a great friend to the people of Pittsburgh, a model citizen and someone who represented the United States with dignity and grace on the world stage,” Obama said in a statement released on Twitter April 13. Rooney, the son of the founder of the Pittsburgh Steelers Art Rooney, served as the Steelers second president from 1975 to 2002, according to his Pro Football Hall of Fame profile. As a prominent and beloved NFL executive, Rooney was elected to the Pro Football Hall of Fame in 2000 for his work with the Steelers. While working with the Steelers, Rooney also co-founded The Ireland Funds, global philanthropic network promoting and supporting peace, culture, education and community development throughout the island of Ireland and Irish-related causes around the world, in 1976, according to its website. Now active in 12 countries, The Ireland Funds continues to support philanthropic causes for the Irish people. President of Ireland Michael D. Higgins released a statement following Rooney’s death, remembering Rooney as “deeply committed to Ireland and the Irish people” and “always conscious of his Irish roots.” Higgins also said Rooney’s work with The Ireland Funds left a “tangible legacy” and began the process to bring peace to Ireland. Mayor Bill Peduto said in a statement released on the day of Rooney’s passing that both the city and the nation owe much to Rooney. “Thank you for your service to our country. Thank you for your devotion to your family and the Steeler nation. Thank you for all you have done for Pittsburgh,” Peduto said. Wolf also released a statement that day offering his condolences to Rooney’s family and honoring the dedication and loyalty he showed to the NFL and to his country. “[Rooney] will be missed, but his legacy will live-on forever in the hearts of the countless players, fans and citizens [who] were lucky enough to experience his passion and grace,” Wolf said.